I'm the toughest man in the world! The challenge. That is what resonates in him. The challenge leveled by someone he has put down once already. Someone who would TAKE what was HIS! Someone who has forgotten that when Dragons Roar, all FLEE. Someone who NEEDS to feel the full wrath...HIS full WRATH! Flames curl around his reptilian body as his tail lashes twice before his thighs coil and release him in a blindingly, brutal lunge. A defiant roar reverberates as his talons rocket forward. The earth shaking roar reverberates in BlackStars ears mere seconds before a flaming missile slams into him like an out of control freight train. The thunderous impact actually seems to make the ground shaking worse for a second as everyone is jostled even those in the air by the concussion. When the dust cloud disappears Blackstar is laying on his backside with a glazed look in his eyes and smoke rising from his body as he tries to get up again. Collin looks a bit worried over this talk of something waking up. They needed to put these villains down fast in case something bigger was coming. "Yo, sparky, hold this for me, would you?" Thunderbolts response to Collins request is an eloquent "Huh?" The word is no sooner out of his mouth then the Potent Blast of energy slams into him like a freight train and bounces him across the landscape where he finally slides to a painful halt several hundred feet away and lies there a moment groaning in pain. Meanwhile Bindher watches with increasingly morbid fascination as Hornet and the Magus work at his device he can see the readouts and laughs out loud as he realizes its to late. Their mysterious Client had warned them about the guardian sleeping beneath the volcano, and that if they weren't cautious in tapping the seal they'd awaken its motlen wrath and be destroyed. Just their luck that this group of heroes would happen across them and ruin everything. Hes interrupted in his laughter by something that makes him laugh even harder. "HAHA don't you see HAH its too late Its awake!" As the disfigured genius laughs nearly hysterically the quaking of the volcano hits a fever pitch and it roars as lava suddenly surges causing Magus to react by teleporting all three of them and the machine to a safe distance. The teams of combatants are broken up as they're tossed around by the sudden eruption and roaring which takes on a distinctly animalistic noise as if some enormous beast were bellowing angrily at the world. mere moments later the caldera of the volcano explodes into rubble as an enormous clawed hand made of pure fire and molten rock slams down onto the side of the mountain. It is followed by a massive shoulder and then a head with two glowing eyes that radiate nothing but pure rage. A second massive clawed hand follows the first and begins to pull an enormous body clear of the mountain, rising up higher and higher as its mass blots out the nearby sun as much as the pyroclastic cloud sent out in its wake. yeah that's a staggered and stunned ouch +1 and ill rule that puts him out of the fight. And now moving to the last part of this chapter and the big boss fight. Binder's hysterical giggling merely confirmed Thomas' conclusion: The seal was broken. The creature would soon wake and break free of the volcano. Turning to Hornet, he offered, "There's nothing more we can do here." Rounding on Binder, he hauled the bound villain to his feet. His curses, however, died in his throat as he saw Binder's eyes focused in two different directions, foam flecking at the corners of his mouth. Binder wrote: "HAHA don't you see HAH its too late Its awake!" The rumbling of the mountain became a roar to dwarf Dragonfyre's. A massive scaled arm burst from the lava below, sending a wave of molten rock toward them. Feeling the searing heat bearing down on them, Thomas opened a portal and transitioned them the three of them and Binder's machine a good distance from the crumbling volcano. Thomas turned and gravely regarded the emerging monstrosity. :OoC" wrote: I'll use Expertise: Magic to identify the creature if I can. Also, are we on the same initiative? Collin stares in surprise at the giant... reptile... dragon... looking... thing. "And this is just your vacation? No wonder you guys have a hard time keeping members." Magus wrote: Turning to Hornet, he offered, "There's nothing more we can do here." Kirk quietly nodded his head as he took in the sight of the creature beginning to free itself, if it looked huge to the other then by his perspective it was colossusly massive. Magus wrote: The rumbling of the mountain became a roar to dwarf Dragonfyre's. A massive scaled arm burst from the lava below, sending a wave of molten rock toward them. Feeling the searing heat bearing down on them, Thomas opened a portal and transitioned them the three of them and Binder's machine a good distance from the crumbling volcano. Thomas turned and gravely regarded the emerging monstrosity. Photon wrote: "And this is just your vacation? No wonder you guys have a hard time keeping members." "Thanks." The tiny hero said to the mage before replying to his new ally. "In my defense, this is my first vacation. So I have no idea if this is normal for heroes." The insect-themed hero then focused his attention on Binder. "Alright spill - what is that thing?" Last edited by Tattooedman on Thu Jan 11, 2018 3:40 pm, edited 1 time in total. "Well, if it's any consolation, four of my six vacations on the job involved in world-ending threats. Three of them weren't even our world. " "So what I'm hearing is that I should always pack my armor...."
"It's not like it takes up that much space. But yeah, definitely a good idea." "Vacations, road trips, 'quick and easy errands,' the walk from the hotel room to the ice machine 2 feet away." "You guys get vacations? What else haven't you told me?" Chris goggled at the size of the monster. If it wasn't the biggest thing they'd ever come up against, it was pretty damn close. "Alright. ", Thomas began, turning to the others. "Alright gentleman. That is a Fire Elemental, it's been trapped in that volcano for at least a hundred years, probably more. A lot more. Thanks to BInder's blithering..." At this, he let the bound villain drop to the ground. "It wants to go home. Barring that, it'll incinerate everyone on this island. Absent any better options, we're going to have to help it get there. Suggestions?" Prism stares in awe at the massive creature that rises from the lava. She couldn't even imagined such a creature to exist. What had these fiends awakened? "By the Light." she said with an awe filled breath, "Where is home to such a beast?" she asked. Prism stares in awe at the massive creature that rises from the lava. She couldn't even imagine such a creature to exist. What had these fiends awakened? "By the Light." she said with an awe-filled breath, "Where is home to such a beast?" she asked. "I'm not sure what name you use for it in this continuity (something vaguely Germanic, I believe), but home is the Elemental Plane of Fire. ", Thomas replies. "Hornet and I will repurpose Binder's power tap into a summoner's circle/portal. Shock, Photon, and...I'm sorry, miss? I didn't catch your name. Prism, was it?" Taking Prism's hand and shaking it politely, he introduces himself. "Thomas Flynn, the Magus Errant. Pleased to meet you. The three of you try to keep it corraled here please and see to any civilians." Turning to Tony he adds, "Dragonfyre, would you be so kind as to ask the Ultimate Destroyer if he's willing to discuss this like a reasonable sentient?" As Thomas explains the situation and makes some preparations, the Massive beast of fire and earth roars once more a roar powerful enough to shake the very ground and which causes the volcano beneath them to seeth and unleash more magma in response. To the others the roar is powerful but to Thomas and Dragonfyre the roar carries a note of something else as well. Tony can almost feel the creatures thoughts Ancient and powerful old as the very stones themselves and as wild and capricious as the fires that roar through his dreams. Tony can feel the dragon inside him roar up in challenge but also feel its cautious instincts kick in. this is power on a scale of the ancients even they are wary of creatures like this. Its in all the chaos that no one notices Blur moving at his top speed zoom past the gathered heroes and scoop up Bindher like hes done with the other Ulimates. Soon the team of villains is taking off in the cloaked ship they use licking their wounds for another day. but the threat of the Massive elemental grows with each ponderous step the monster takes. 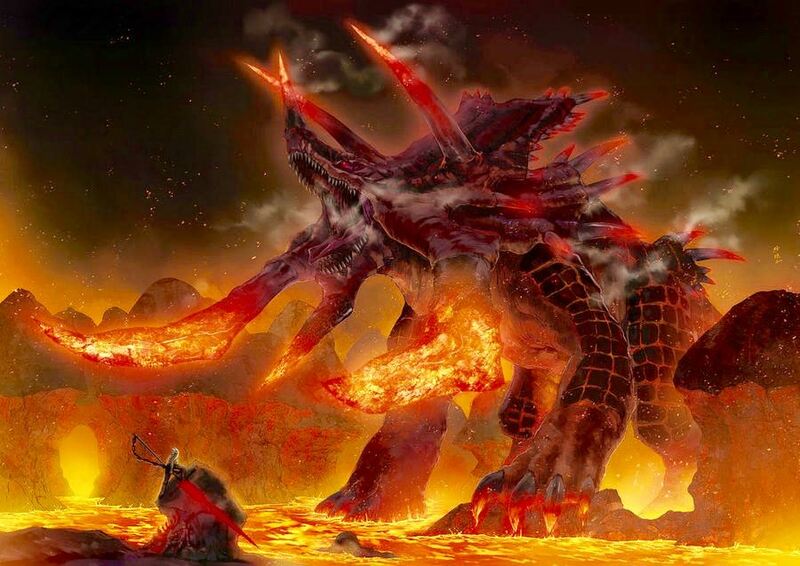 Fires break out around it as the very heat the creature gives off is like a blast furnace, its mere breath a living wave of heat that scorches the very ground and sends people scurrying from its path as houses are ignite, trees wither and plant life burns. Everyone can see the many homes of the more densly packed neighborhoods below it as it makes its way down the slope seeking what ever it is seeking. Ok so Initative is not really required persay well use the order merely as a guidline as you guys attempt to send our massive friend here home. its enormously powerful so fightings not reccomended but feel free if you so choose. Plenty of opportunities for daring doo as the volcanoes in full eruption now lava flows everywhere which means plenty of daring rescues. initial tech and arcane checks of a dc 30 would be sufficent to begin ritual preparations needed. apologies for the late run here been stuck in my own head for a bit.